Your opponent cannot target Spellcaster-Type monsters you control with Spell Cards or effects. If a face-up “Magician” Pendulum Monster Card(s) leaves your Monster Zone or Pendulum Zone: Add 1 “Magician” Pendulum Monster from your Deck to your hand. You can only use this effect of “Star Pendulumgraph” once per turn. Happy Thanksgiving! I hope this is a joyous holiday for all of you out there! Star Pendulumgraph is a Continuous Magic card, and it’s pretty good also. Reasonable protection is offered here, protecting your Spellcasters from effects and Magic cards. Obviously you still need to watch out for Traps. It also replaces a lost Pendulum Monster you control by adding another to your Hand from the Deck. It’s once per turn, which helps add balance, keeping this a good card, instead of being insanely good, or even broken. Not much else to say here, it’s another good asset for this Deck. Star Pendulumgraph stops your opponent from using Spell cards on your Spellcaster monsters. Immediately this card shows playability not only in Pendulum Magician, but Spellcaster decks as well. The second effect revolves around Pendulum Magicians, searching a Pendulum Monster from the deck to your hand when a Magician Pendulum leaves the field in any way. Once per turn, it doesn’t matter if it is destroyed or popped back to the hand, as long as it is a Pendulum Magician it will activate and search for you. The lockdown ability this has makes it a good card. It’s searchability makes it an even better card. It is a great card in the archetype, but retains some versatility outside of it, and could be considered usable in other decks, even without the ability to search it out. Support is support. Versatility is even better. Star Pendulumgraph is a free Continuous Spell Card. It protects Spellcasters from being targeted or effected by Spell Cards. That is great in non Pendulum Spellcaster decks. Obviously, the main benefit is the hard once per turn search effect. 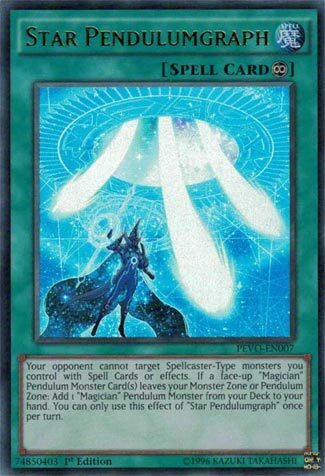 If a Magician Pendulum Monster leaves the Monster or Pendulum Zone, you can search a Magician Pendulum Monster from your deck. The protection is nice, but the search is better. Either player can trigger the effect, and searching on your opponent’s turn is very good for hand advantage. As I promised, we are going to look at the Pendulumgraph cards, with the first one being the Spell Card, Star Pendulumgraph. Star Pendulumgraph prevents your opponent from targeting Spellcasters with Spell effects. This is cute, and protection of any sort is always lovely as I love to say, but this isn’t what makes this staple in the Pendulum Magician deck. If a face-up Magician Pendulum Monster leaves the field, whether it was in the scale or monster zone, you can add a Magician Pendulum Monster from the deck to the hand. An easy search for cards like Wisdom-Eye, Double Iris, Harmonizing Magician, just getting to any Pendulum Magician card is great. Thankfully this is a hard once per turn otherwise it would be broken with more than one of the field. I mean, what is there to say? It is an easy search, especially with Wisdom-Eye Magician. It would be a 3 of if it wasn’t a hard once per turn and/or not searchable, but 2 is fine since it is searchable and a hard once per turn. Still outstanding for the deck.